Place a flour and baking powder, soda bicarbonate and salt in a bowl. Mix yogurt with salt and sugar. Add this to flour and add a cup of water and mix gradually to make soft dough by light kneading. Incorporate 2 tbsp of oil into the dough and cover the dough with wet cloth and keep it aside for and hour. Divide the dough into sixteen equal parts, roll them into balls. Cover and keep them to ferment for 10 minutes. Grease your palm with little oil and flattened the balls. Roll the balls into five inch diameter diskettes. Heat sufficient oil in a pan and deep fry bhatura on high heat till light brown on both sides. Drain on absorbent paper. Soak chana for at least 6 hours. Drain. Add 3 cups of water and half a tsp of soda bicarbonate to the chickpeas and cook in a pressure cooker till done. Heat clarified butter in a pan and fry potatoes until soft. Remove and place on absorbent paper and set aside. In the same clarified butter, add onions and saute till pink. Add coriander powder, cumin powder and red chilli powder and saute again. Add boiled chickpeas ans salt. After 5 minutes add garam masala powder, dry mango powder and pepper powder and cook for 2 minutes. Add potatoes and tomatoes and cook for 2 minutes. 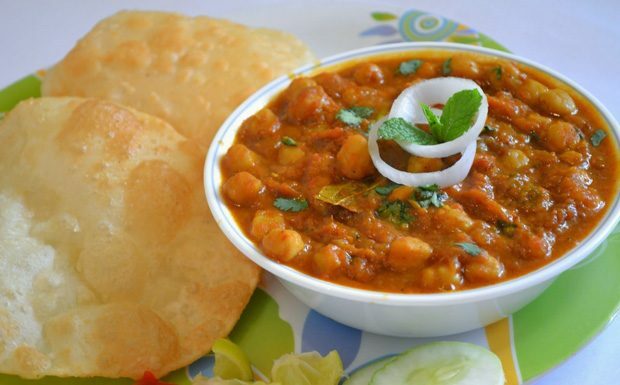 Serve bhatura and chole with onion slice and lemon.